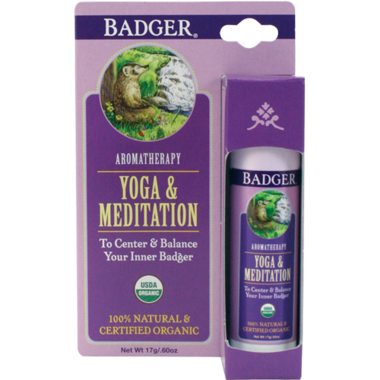 Gain center and balance with this Badger Aromatherapy Yoga & Meditation Balm Stick. Just as the noble trees are deep rooted in the ground, this blend works to bring a deep rooted centering and grounding experience, essential to the practice Yoga and Meditation. The scents of Sandalwood, Frankincense, and Myrrh are used in both Eastern and Western traditions to support the practice of meditation by inspiring a mood of reverence and calm centeredness. Cedarwood sharpens the mind, and the citrus essential oils of Mandarin and Litsea Cubeba create a cheerful state of peaceful awareness. Badger uses the “base note” essential oils derived from the bark of the Cedarwood and Sandalwood trees, and CO2 extracts from the tree and root resins of the Frankincense and Vetivert. great product, amazing smell! Convenient tube. Not too impressed with this. As the oth two ladies have said, no, it doesn't last long, AT ALL. The only scent I get is the mandarin & a very little bit of cedar. Since they mentioned Frankincense, Myrrh, & Sandalwood first in their description, one would think those would be a little more prominent. I also find it very greasy & that lasts a while. I won't be buying this again, not worth the price either. Can't quite describe the scent but it's not musky, floral or citrus, but something very calming and pleasant. Can smell a hint of citrus coming through though. Shaped very much like Badger Sports Sunscreen stick. The scent lingers for quite some time which I find to be different from reviews by other customers. It does eventually disappear though. I find that compared to the Chest Rub by Badger, the scent lingers longer while the scent in chest rub disappears in not time & it's not supposed to do that since it's meant to help with breathing in times of cold. Expensive for the amount & price. It does provide comfort via scent like it's supposed to but due to its price I don't think it's a regular buy for me. Maybe as a treat or gift to myself on occasion. I put this on my wrists and temples before I go into hot yoga. I love the smell, but it doesn't last long at all. I really love this product. It smells heavenly. The only negative thing I have to say is that the scent doesn't last very long, nor is it strong enough. I put some under my nose, at my wrists and temples, and I love it. I also bought the tension soother, and that scent is even better! Thanks Badger!